Render this image in Deutsch (de) English (en) español (es) français (fr) . Deutsch: Politiker haften für ihre Flüchtlinge! English: Politicians are responsible for their refugees! Español: ¡Los políticos son responsables de sus refugiados! Français: Les politiciens sont responsables de leurs réfugiés! To embed this file in your language (if available) use the lang parameter with the appropriate language code, e.g. [[File:Politicians are responsible for their refugees.svg|lang=en]] for the English version. 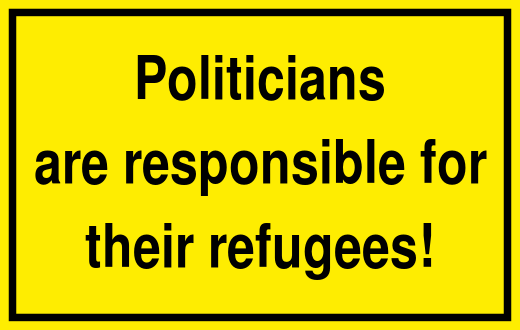 Information sign: Politicians are responsible for their refugees!